Located seemingly at the bottom of the world, Tasmania is Australia’s southernmost and only island state. Affectionately referred to as ‘Tassie’ or the ‘Apple Isle’, it lies 149 miles to the south of the mainland and is separated by Bass Strait . The state includes not only the main island, but also 334 surrounding islands. Half of the 500,000 population lives in the southern capital of Hobart, the island’s largest city, while Launceston is the largest city in the north. The state promotes itself as a ‘green’ state, home to the world’s first environmental party and with around 45% of the state protected within national parks, reserves, and World Heritage-listed sites. The island is believed to have been attached to mainland Australia until the end of the last glacial period around 10,000 years ago when sea levels rose and separated the region. It is mostly composed of Jurassic dolerite intrusions, with the world’s largest areas of dolerite, which are best exhibited in the ‘Organ pipes’ columnar rock formations at the top of Mount Wellington, located behind the city of Hobart. Tasmanian Aborigines are thought to have inhabited the state for up to 40,000 years before the Dutch explorer, Abel Tasman , first sighted the land in 1642. He named it ‘Anthony Van Diemen’s Land’ after his sponsor, which was shortened by the colonizing British to ‘Van Diemen’s Land’, and later renamed ‘Tasmania’ after its European discoverer in 1856. While the indigenous population was believed to be greater than 5,000 when the British colonized the land in 1803, infectious diseases, persecution and fighting led to only around 300 left in 1833, most of which were relocated to Flinders Island. The first settlers at what became known as ‘Hobart Town’ were mostly British convicts and their guards, sent to develop industry and agriculture, while harsh penal colonies were constructed around the island, most notably at Port Arthur. The Colony of Tasmania existed on the island until 1901 when it was federated with five other Australian colonies to form the Commonwealth of Australia. Due to its small size, Tasmania can be easily explored in a couple of weeks, with a few days based in Hobart and the surroundings, as well as some time in one of the state’s many spectacular national parks. Every Saturday, the Salamanca Market attracts locals and tourists alike to this Hobart waterfront setting, where everything from fresh produce to locally-made handicrafts and woodwork are on sale. It is a festive event, with live music and entertainers throughout the stalls which stretch along the front of the area’s attractive Georgian sandstone buildings. When the market is finished, there are plenty of cafés and restaurants nearby to relax in, or take a walk up historic Kelly’s Steps into the beautiful suburb of Battery Point, where the city’s first settlers built their tiny Georgian cottages. The market is held every Saturday between 8:30 a0 feet and 3 p0 feet, regardless of the weather. Providing a spectacular backdrop to the city of Hobart, the summit of Mount Wellington/Kunanyi is a short 20-minute drive from the city. The road switchbacks up the mountain, passing through temperate rainforest and sub-alpine flora, as well as some impressive glacial rock formations. The views from the top extend across to Bruny Island and the Tasman Peninsula on clear days, and there is an interpretation center to help you identify what you are looking at. The weather can be decidedly blustery and cool so take a jacket with you, no matter what the temperature is in Hobart. There are plenty of walking and mountain biking trails along the mountain slopes, as well as barbecue and picnic facilities, and the best part is that the park is free and open year-round. Around an hour and a half drive from Hobart lies the historic Port Arthur site on the spectacular Tasman Peninsula. It is the most intact convict site in the state, with more than 30 buildings, ruins, and restored structures which operated as a penitentiary between 1830 and 1877. Entrance fees allow you to explore this extensive site over two days, participate in a guided walking tour, and take a harbor cruise to view the site from the water. The museum offers an extensive insight into life for the convicts, soldiers and families who lived at Port Arthur and is open every day of the year. Located not far from the Port Arthur Historic Site, the Tasman National Park is an area of rugged beauty on the Tasman Peninsula. It includes some unusual geological formations, such as the Blow Hole, Tasman Arch, the Devil's Kitchen, and the Tessellated Pavement, all of which can be easily accessed by car. In addition, there are also some excellent coastal walks, offering stunning views out across sheer cliffs which drop dramatically into the tumultuous ocean below. This unique natural formation lies on the very edge of central Launceston, within a 15-minute walk of the city along the banks of the Tamar River . Known locally as ‘the Gorge’, this urban reserve features a swimming pool surrounded by bushland, a landscaped Victorian garden, café, and the beautiful Kings Bridge which was floated into place in 1867. Part of the Tasmanian Wilderness World Heritage Area, Cradle Mountain - Lake St Clair National Park is an extensive area of ancient rainforest, alpine vegetation, and glacial carved lakes. 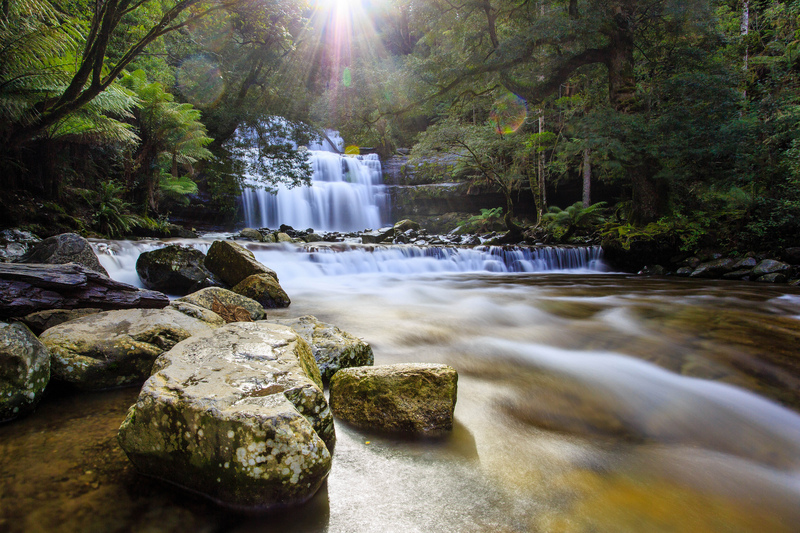 There are plenty of walks available, ranging from short 20-minute strolls into old-growth rainforest, to the world-famous six-day Overland Track walk which begins and ends within the park. You can camp in one of the many facilitated camp sites, or bunk down at the well-appointed Cradle Mountain Lodge. 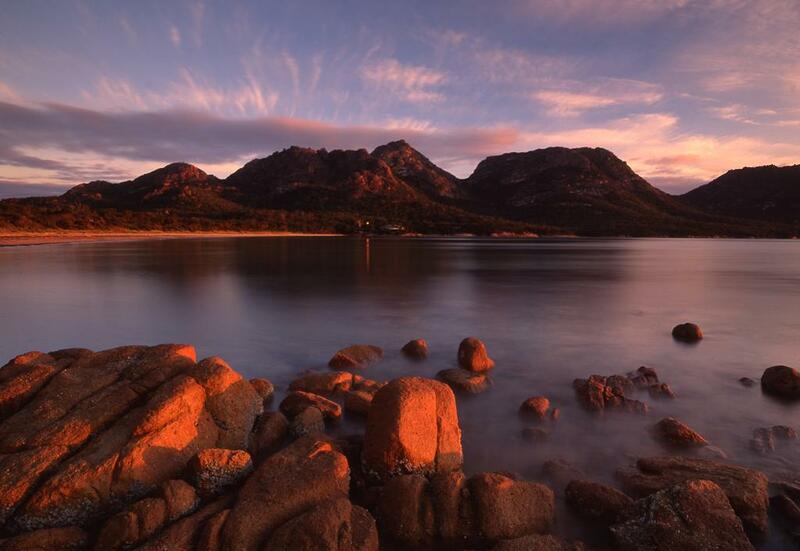 With a spectacular location jutting out from the east coast, Freycinet National Park has become a favorite destination for its dramatic pink granite peaks and the picture-perfect curve of white sand known as ‘Wineglass Bay’. The most famous walk is the 45-minute hike over to this beach which takes in stunning views on the approach. After a swim, you can continue on to Hazards Beach which sees far fewer tourists, or head back the way you came. There are plenty of camp grounds available and the Freycinet Lodge offers luxury accommodation within the park boundary. One of the largest private collections of modern art and antiquities in the world, MONA has stormed onto the Australian art scene in a blaze of controversy. Set over three floors which sink into the Earth in Hobart’s northern suburbs, this architectural wonder is as impressive as its contents. MONA is located on a 3.5-hectare site which includes the Morilla vineyard and cellar door, the Moo Brew microbrewery, and a number of bars and function centers. A high speed ferry departs from Hobart’s waterfront up the Derwent River, transferring guests to the museum steps in around 30 minutes. The gallery is open from 10 a0 feet-6 p0 feet daily, except Tuesday. Located in the island’s far North West, the Tarkine is the largest temperate rainforest in the world, covering a massive 1,467 square miles (1,500 square miles). There are lots of walking trails to explore and picnic areas to relax in, while a luxury eco-lodge on the edge of the wilderness has won multiple awards for its commitment to sustainability in the area. Tasmania experiences a cool temperate climate with mild summers and cold, wet winters, separated by distinct spring and autumn periods in between. Summer extends from December to February and generally sunny, dry skies prevail, although occasional rainy days are common. Nighttime temperatures can still drop significantly and the highland areas are surprisingly cold. This is, however, the best time to visit the state, particularly if you are heading into the great outdoors to hike or camp. Winters can be wet and miserable, with regular freezes throughout the inland areas. Autumn weather is variable, while the spring transition is often windy, with snowfall common until October. The majority of Tasmania’s residents are of British descent, with around 10,000 ‘founding families’ from the mid-19th century thought to be the ancestors of around 65% of the state’s current residents. Compared to other Australian states, Tasmania receives relatively little immigration and the population is considerably homogenous. While half the population lives in the Greater Hobart area, Launceston, Devonport, Burnie,and Ulverstone are the other major population centers. In recent years, Tasmania is making a name for itself with locally-grown and manufactured produce, in particular wine, cheese, oysters, and salmon. King Island off the northwestern coast and Bruny Island to the southeast have both built strong reputations for boutique dairy products, while the Tasmanian beer brands of Boags and Cascade are both found widely across the Australian mainland. The cold-climate produce is on show every summer at the annual ‘Taste of Tasmania’ festival, which allows patrons to sample food, wine, and beer from across the state. While British cuisine originally dominated, the arrival of immigrants and influence of café culture has seen this diversify and flourish and a wide range of restaurants and eateries now offer up a range of cuisine. Mining, agriculture, and forestry have all been major industries for the state since European arrival, together with a major hydro-industrial initiative during the 1940s and 1950s. While Tasmania has traditionally exploited its natural resources, today there is a strong movement to protect them, with tourism rapidly becoming a major earner for the island and the long-term incentives of retaining old-growth forests and water resources outweighing the short-term gains of destroying them. Apples and pears have traditionally been the major crops grown in the state (resulting in the name of ‘Apple Isle’), however in recent years there has been a diversification into wine, cherries, saffron, and pyrethrum, as well as a boom in the seafood sector with Atlantic salmon, abalone, and crayfish harvested. All of Australia’s major domestic carriers service both Launceston and Hobart International Airport, with regional services accessing Burnie, King Island, and Devonport. The ‘Spirit of Tasmania’ ferry operates between Melbourne and Devonport, allowing visitors to the state to bring their cars and camper vans, and has helped boost tourism significantly. Bus lines operate between the major centers, but if you want to access the national parks and wild areas for which Tasmania is famed, then you will need to hire a car. Multiple car hire companies operate at both major airports with competitive rates. A number of tour companies operate multi-day bus trips throughout the island, taking in its major sites. These vary from up-market coach tours targeted at the over-50s to adventure camping trips for backpackers. Tasmania hosts a number of annual festivals, most of which occur during summer when temperatures are warm and mainlanders are on holidays. These include the Sydney to Hobart Yacht Race which begins on Boxing Day in Sydney, arriving in Hobart three or four days later, and coincides with the annual Taste of Tasmania food and wine festival. The Falls Music and Arts Festival is held every New Years at Marion Bay, drawing young punters from across the country, while MS Fest is held in Launceston each year to raise money for those with multiple sclerosis. The Cygnet Folk Festival is held in this southern community in mid-January each year and has a reputation for being one of the country’s most important folk music events. The MONA gallery hosts two annual festivals - one in early January and another at the peak of winter - drawing alternative musicians and artists from across the world and curated by Brian Ritchie. ‘Ten Days on the Island’ is another arts festival held in late Summer which centers around the iconic Spiegeltent. For the rural communities, the annual ‘Agfest’ is a three-day agricultural show in early May which showcases the state’s industry, while the Targa Tasmania road rally draws drivers from around the world to the state-wide course. Tasmania is at its most lively over the summer months when multiple festivals are held and domestic tourists are on holiday. The weather is most favorable for outdoor pursuits and enjoying the state’s magnificent beaches, and you can take advantage of the wild camping opportunities. Accommodation can, however, be in high demand, particularly during the Christmas/New Year periods, in both city hotels and national park camping grounds. If you are going to travel during this period, book well ahead. If you are driving on the state’s rural roads, avoid traveling at night when the native wildlife is at its most active. Kangaroos, wallabies, and possums are often stunned by car headlights and jump into oncoming vehicles. Highland roads can get slippery with frost during the colder months, so take note of road warnings and drive with care. Despite its cool temperatures compared to the Australian mainland, the ozone is thinner above Tasmania and the sun can be surprisingly dangerous. Even on slightly overcast days it burns easily, so wear a hat and good sunscreen, even if you don’t feel like the temperatures justify it.